There are so many days that all we can think about is what is going on in our lives that cause us pain or sorrow. This can be caused by circumstances or illness. All I know is that we get tunnel vision and concentrate on the negative. Instead we should be concentrating on life. Here's where I love being Jewish. The symbolism and traditions are so rich. Chai. The Hebrew word for living or life. The two letters that make up this word for life are Chet and Yud. The numerical value of Chet is 8 and the numerical value for Yud is 10. So this glorious word for life has a value of 18. It has always been considered lucky to give gifts in multiples of 18 for weddings, bar mitzvah or for use in transactions. It simply implies the blessing of a long and happy life. 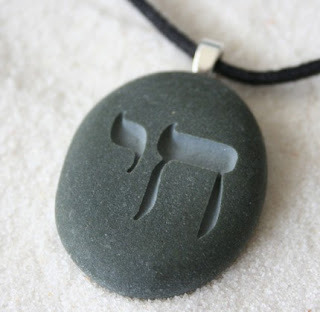 Some theorize that it signifies Judaism's emphasis and importance of life. In general, I will hold dear to my chai'.